Regions with intensive livestock breeding have a serious oversupply of liquid manure. The available area in such regions is often not large enough to make use of the accumulating amount of nutrients. Therefore, there is a need for sustainable solutions for improved transportability and reduction of the nutrient surplus. 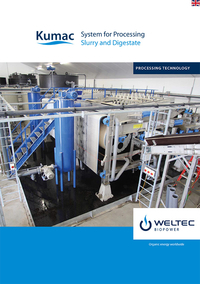 With its Kumac processing technology, WELTEC has created a solution to this problem. Since 2007, the technology has already been successfully used in around 15 locations. 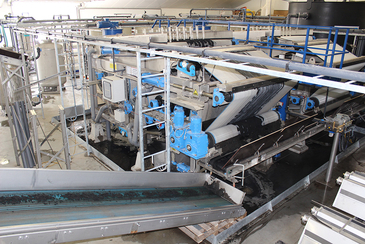 In a multi-stage process, the Kumac processing system separates solid matter from water. The result: About 50 percent clear water, approximately 25 percent solid matter and about 25 percent liquid nutrient concentrate. This technology has already been in continuous use for several years and is successfully applied at about 15 locations with intensive livestock breeding or large biogas plants. One of the key benefits of the solution – which is already well established in the Netherlands and Belgium – is the high technical plant availability. The scalable modular system can be used from an amount of 50,000t/year. If processing needs are higher, a combination of several Kumac lines can easily be implemented. 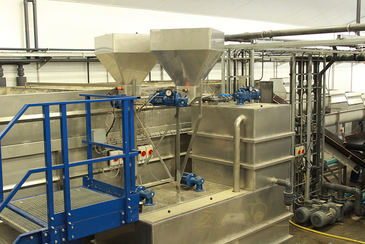 First, additives are mixed with the source material with a custom-developed mixer. This enables a short reaction time and economical use of individually composed flocculants. The additives ensure flocculation of even the finest components. At the same time, the addition of polymers facilitates the separation of certain substances from the water and the minimisation of odours. In the next step, the substances are drained in a special belt filter process. In this process, they are transported on a belt filter over various rolls and cylinders and pressedagainst a second water-permeable belt with increasing pressure. The drained solid matter has a dry matter content of about 30 percent and can subsequently be used as fertiliser, compost, litter or biogas substrate. The remaining liquid phase is first treated in a stainless flotation tank. Using fine air bubbles, small organic particles and suspended matter are separated and settle in a floating layer and to the bottom of the tank. 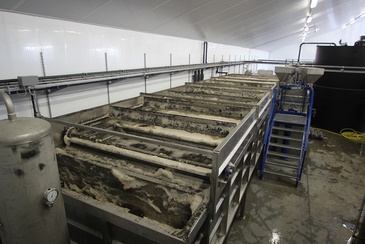 The foam and sludge are then re-transferred to the treatment process. The other solid components of the liquid phase are separated by a filter. 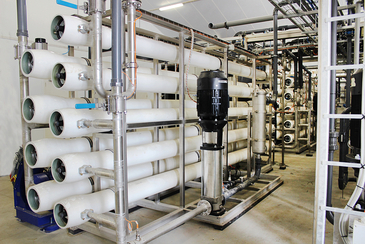 The final process step comprises the application of a three-stage reverse osmosis procedure. The remaining liquid phase has already reached a very clean state. The semipermeable membranes in the three-stage reverse osmosis procedure can separate 95 to 99 percent of the dissolved salts and nutrients. The separated nutrient concentrate can be used as liquid fertiliser that is easy to transport. The clean water that is left over from the treatment in the ion exchanger can be used at the local facilities or be returned to the water cycle. Solid phase can be sold as mineral fertiliser, agricultural fertiliser, litter, biogas substrate, compost, etc.